When the Cango Caves tour had finished, we grabbed a coffee and hit the road. It was still fairly early in the afternoon, but we had a lot of ground to cover. 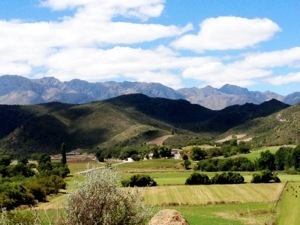 We took a different road back from Outdshoorn to the N2 and drove through Robinson Pass. It amazes me how each road can be more beautiful than the next. Robinson pass was incredible with its dramatic green cliffs and windy roads. 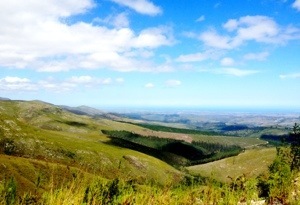 We had just enough time to admire the view, and then before we knew it we were at Mossel Bay. Lunch time! We wanted to find a local place for some cheap, good food. We were looking for some run down joint that was the gem for all the locals to eat at. We drove through the town, a little indecisive about where to go, then decided to head down to the docks to see what we could find. As soon as we hit the docks we knew where we were eating. It was a shabby looking place from the outside, with bamboo walls and half a thatched roof. There was smoke coming out from the middle of the place and it sat right out on the edge of the water, in among industrial fishing boats and a parking lot full of trucks. A big sign on top read Kaai 4. We parked the car and walked towards it. As we walked in, we were greeted by the owner, Sean. He was a wonderful man, with an eye patch, a bucket hat and a great sense of humour. He walked around the dirt floor of the restaurant barefoot, meeting and chatting with all the patrons. “We were just driving by and it looked like a great place to eat.” We said. 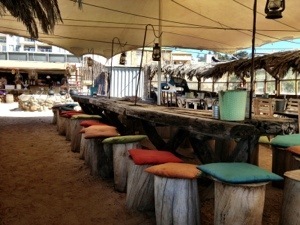 Turns out, Kaai 4 is also the number one most recommended spot to eat in Mossel Bay by the Lonely Planet guide. Well done us, what a find! “I don’t much care for vegetables to be honest. But I do have some amazing meat and seafood dishes! My favourites are the mussel pot and the Meat basket. The mussel pot is made to order and everything is cooked over there on that fire. Traditional Braai style!” He stood there beaming at us. He was obviously so proud of his little restaurant, and his enthusiastic attitude was contagious. On top of that, the food was cheap. Probably the cheapest we had seen in South Africa for what you were ordering. We decided to go for both his suggestions and share. Then we sat down along the water and had a cold beer. When the food came out, we were not disappointed. The portions were huge, and everything looked so delicious. Mussels cooked in a creamy sauce and served with rice, or the South African starch equivalent (the name of it has escaped me). Then there were ribs, and chicken and sausages, each served with homemade bread. Oh wow. What a feast! We ate and ate and ate until we couldn’t move. Then we used the bread to soak up the leftovers. It was the best meal I have had in the country, hands down. Sean wandered over to check on us a couple times, and we couldn’t stop raving about the meal. Of all the places we could have stopped at in Mossel Bay, I am so happy that this is where we ended up. If you ever find yourself in Mossel Bay and you DON’T stop at Kaai 4, then you are insane… Unless of course you’re a vegetarian. When we’d stuffed ourselves as much as we could, we thanked Sean and his wife and carried on. We started back on the N2, with our next scheduled stop as Swellendam. A little ways down the highway, however, I changed our plans. So we turned off the highway and drove the 35 kilometers South to Witsand. The place was spectacular! 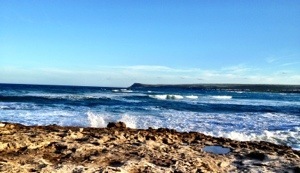 We pulled up at the beach and the view was so pretty that I couldn’t stop talking. She was laughing at my giddiness. Maybe everyone is right, Canadians do talk a lot. 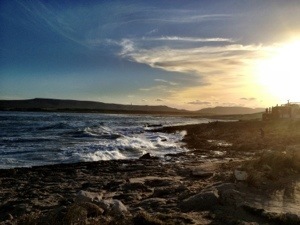 We wandered around the rocky shores, then climbed some nearby sand dunes as the sun was going down. We never saw any whales. Had I read a little further, we would have found out that whale season is over right now. Also, the tide was in, so oyster picking was out. But the place was beautiful. We climbed up and down the sand dunes with some local kids, and I laughed until my stomach hurt at Kelsi’s limp. In the sand, she looked like either Igor, Quasimodo or Gollum. I kept poking fun at her “yes master, this way master, follow me” until we couldn’t contain ourselves any more. We decided to head back to the highway before the sun completely set, so we hopped back in the car and drove onwards. However, we still had our “no road twice” rule, and so I found us a different route back to the N2. This route was back road gravel streets that went through farmland and vineyards. The place was beautiful in the setting sun with the long stretches of slightly curving hills in the background. Since day one, I’d been on a mission to get the perfect photo of a single tree in the red, African sunset. It still hadn’t happened. We tried to find one along this route, but none of them worked with my idyllic image. Then we came across a couple of ostriches, roaming in a field. 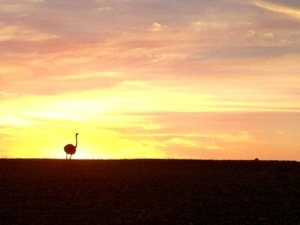 “Ostrich in the sunset photo!” We both yelled. Kelsi pulled over and I jumped out to take the photo. Screw the tree in the sunset, this picture was incredible. We laughed the rest of the way to Swellendam about the silly ostrich-sunset photo. It was more than I had ever expected! This entry was posted in Africa, South Africa and tagged Afrikaans Braai, Kaai 4, Road trip, sunsets, Travel, Witsand by hilarylust. Bookmark the permalink.